It’s also legal to do breeding loans and free gifts across state lines, but no money can be exchanged. I hope some people are feeling generous towards those currently without enough experience for Pokies. Thanks so much, Kris! I just added that info as well! I was unclear about the breeding loans. I will be publicly asking for Sri Lankan Pokies for Christmas! I probably should put this on the Podcast post, but since it is the same topic I will leave it here. You say often that the hobby strives to preserve the species and you are opposed to the ban on interstate trades. I think i disagree with the first part. Most hobbyists do not attempt breeding in my experience. I think most simply like owning them. I obviously can’t prove this, and I admit I am cynical… I just think most of the uproar is from hobbyists who simply don’t want to be told what they can or can not own. I think there is a large portion of keepers who just want to own big fast and potent tarantula species. Love the content as usual. Keep it coming Tom! Hey Tom, you’ve mentioned in the past that you were big into snake husbandry, and after listening to your most recent podcast and doing a bit of surfing, I came across a successfully fought ruling regarding the amphibians and I believe pythons among others in the US last year. I’m wondering what applicability it might have regarding Poecilotheria and others with the current restrictions; does their inclusion on the US endangered species acts trump this (no pun intended)? The Lacey act has been fought before regarding its restrictions (though perhaps it does not apply to endangered species? I’m fuzzy on how the two dovetail regarding this). Hello! I’m currently trying to get someone in USARK to speak to me about this, as I know that they are fighting the same laws (Lacey Act) and have made progress. 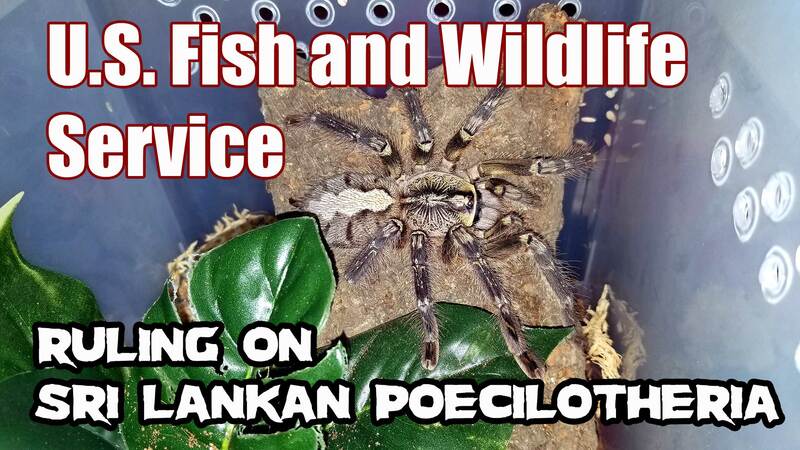 We have a common interest, so I would like to galvanize the tarantula hobby to support them. To be honestly, I’m still trying to wrap my mind around exactly how these laws work. Part of the issue is that they can be misinterpreted and misused (hence USARK’s fight). UGH. I just wrote a long reply to this and lost it. Long story short, yes…USARK is fighting the same laws, and that benefits the tarantula hobby as well. I’m trying to get someone in USARK to do an interview with me so that we can hear how supporting them would benefit our hobby as well. These laws are VERY confusing, outdated, and often misinterpreted, hence why USARK has been able to make progress against them (and why folks like you and are I STILL confused over how they work haha). I’m still trying to figure it all out! Thanks! I highly recommend that Poecilotheria read through the Federal Registry regarding the ESA listing for the species in this genus. Its really interesting reading. A least review the Trade and Comments sections, which will like address a lot of the questions and concerns that hobbyists may have.